Our accommodation consists of 10 Rondavel Style cottages depicting the Maasai Style; each rondavel has two rooms, we have used warm colours and decorated with locally made furniture and fabrics giving it a true African feel. Rooms can be configured as single, twin, double, triple or family. Our rooms contain everything you will need during your stay at Nsya Lodge, complimentary bottled water, toiletries, mosquito netting, a turn down service is available should you require. Bird Watching – Tanzania’s bird life is rich and diverse, with over 1000 species available in and around Tanzania. For serious twitchers specialist birding guides can be arranged. For those new to birding enthusiasm will breed a curiosity in our feathered friends that will have you returning year after year. Hiking to the waterfalls - There is no better way to experience the African bush than on foot, where the tracks, beetles and bugs spring to life. It is likely that you will get close to larger mammals. Biking to the Lake Manyara - Biking does not get better than what is available in Tanzania. The country lives on bikes and with that there are thousands of miles of single-track routes to explore. Most of these paths are nice and smooth and easy riding. Obviously there are more challenging routes for the adventurer. An easy cycle ride down the Great Rift Valley wall; into the farming village of Mto Wa Mbu. Experience local cultures from the bike, ride through some of the Manyara ground water forest and between small herds of wildlife on the lake shore. Night Game Drive - The African bush certainly does not sleep at night! Learn about and encounter Africa’s elusive nocturnal creatures on a night drive, whether you are searching for the rare pangolin or watching a leopard hunt, you will be surprised by what goes on after dark. Visit to the MaasaiBomas - The Maasai are an indigenous ethnic group of semi-nomadic people living in northern Tanzania and Kenya, and they are the only group allowed free travel over the border. The Maasai reside near many game parks and their dress is very distinctive. Consequently, they are probably the most well-known African ethnic group in the world. The restaurant area serves mouth watering local and international cuisine, all dishes freshly prepared after a daily trip to the local market. We are prepared to cater for all special requests for meals if need be. Our main bar area offers variety of alcoholic and non alcoholic drinks, for those who want to keep up dated with the latest news and sports satellite t.v is available at the bar. Another ideal place to unwind after days safari is at the at the swimming pool bar just relax have that all-important sundowner from the pool bar, enjoy a game of pool or darts with your friends or family by the pool side. Our curio shop is inside the lodge for those who need to take ideal gifts back home or souvenirs for themselves, moreover complimentary WI-FI internet access is available around the main areas of the lodge. Plenty of space is set aside for camping in the gardens especially for overland trucks, offering campers fully equipped kitchen and bathroom. Our Lodge is situated in Mt wa Mbu just 5 minutes drive from Lake Manyara and 2 hours drive from Arusha. You are guaranteed a warm welcome at Mt wa Mbu’s most relaxing stopover; in Mto-wa-Mbu; on the doorstep of Lake Manyara National Park and only a stone’s throw from Tarangire Park and Ngorongoro Crater. Great hospitality and service provided by a dedicated team to cater for your need to experience wild Africa. For many people who have spent years in the African bush, Tarangire is their favorite national park on Tanzania's richly endowed northern circuit. Looking down from the western Rift wall along the road tot is easy to see why Lake Manyara National Park was once described as "The Emerald of Africa". Our accommodation consists of 10 African style cottages and 3 additional luxury tents, all of which have en-suite bathroom, toilets and electricity. Our restaurant, with wide verandah, provides a mouth-watering selection of meals, including specialty Indian food as well as international and local cuisine. Nowhere else in Tanzania have so many different tribes gathered in such a small area. Many people have still kept their traditions. All furniture is handmade by Tanzanian artisans. Our goal at our Lodge and Camp is to make a true difference to our guests stay in Tanzania, your home away from home. A dedicated team is here to ensure your stay with us is pleasant and you have wonderful memories, to take away with you. Our Lodge is set amongst acacia forest within spacious beautiful gardens, away from the hustle, giving you the upmost relaxing and peaceful atmosphere. Just 5 minutes drive from Lake Manyara National and 2 hours drive from Arusha. The variety of accommodation suits all types of holiday makers’ cottages from single, double, triple and family rooms. All furniture is hand made from Tanzanian Artisans giving us an opportunity to support local community, enabling us to create a true traditional African style lodge. 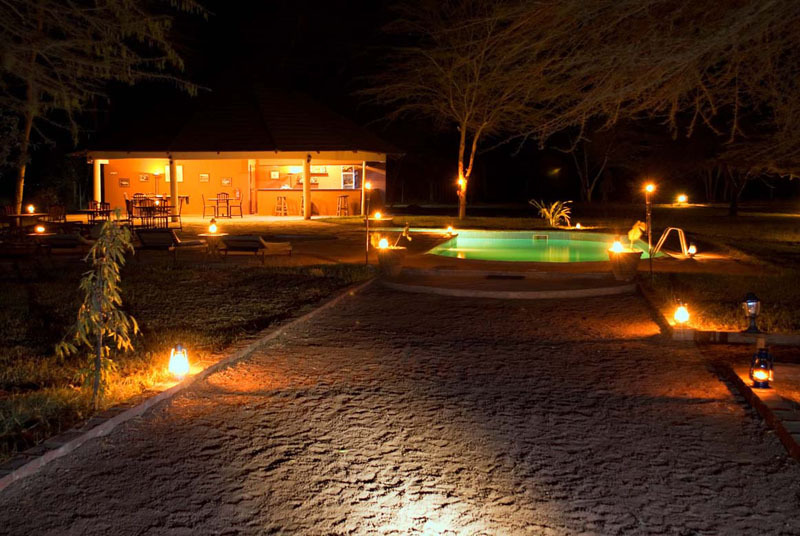 Our lodge has all that you could wish for to make your holiday one to remember during your visit to Tanzania. Karibu (welcome) to our fine Lodge!